Do You Know Which Exercises to Do? Recently, I received an awesome inquiry in my Contact Me form at Straightforwardfitness.com. As I was responding to it, it crossed my mind that I might as well share it in a newsletter so that others can benefit as well. Following is a paraphrase of the question and response. Question: If I use a machine like Hammer Strength Row which purports to work all my back muscles, do I need to continue to do Lat Pulldowns and other back machines along with it? Answer: The answer may vary according to a few things such as your specific goals, age, what type of workout you like, physical limitations, how much time you are willing to commit and how many days a week you want to strength train, etc. Since I don’t have that info and I have no idea if you are doing total body workouts or a split routine working certain muscle groups on certain days, I will have to go with a general answer for now. The row (be it Hammer Strength or any other typical equipment manufacturing company) works many of the back muscles, according to which grip you use: 1) palms facing each other with elbows close to the body as you pull or 2) palms facing down with elbows flared at about chest height as you pull. The first grip hits more of the mid to lower back as the second grip hits a bit higher as well. They are both excellent variations of the back row machine. I would continue to do the other machines because variety is a beautiful thing. The lat pulldown to the front is a great exercise to couple with the row. If you chose to do only the row every workout, your muscles would eventually get used to it and progress would stall. Plus, it can become boring. BONUS TIP: Be sure and check out the exercise of the month below for the free weight version of a back row. Pick a couple of exercises per muscle group so that you hit them from different angles. You might do 2 or more sets of pulldowns and 2 or more (according to your goals and time constraints) for the rows in the same workout. Or you may even do both grips and 4 sets on the row one day and then the next workout do pulldowns and row. So many ways to skin this cat. lol. I personally like to mix it up with free weights and machines in the same workout. Free weights and body weight exercises can be manipulated in ways that make them more functional moves, as opposed to machines that tend to isolate muscle groups in a fixed range of motion. Functional exercise is all about mimicking activities of daily living, making them a smart choice along with machines. If you have never worked with free weights, you may benefit from working with a trainer who can show you proper form and technique. I have a few videos at my YouTube channel showing form with many free weight exercises so you can feel free to check them out. To go there, click here. Also my strength training routine page shows a few routines in case you haven't seen that yet. I hope that helps shed some light on why it is smart to choose a variety of exercises along with mixing up the use of toys such as machines, free weights, body weight exercises, bands, bosu, Swiss ball, medicine ball, kettle bells, TRX, etc. Keep your body guessing by changing things up and you will continue to see results as opposed to hitting frustrating plateaus. Good luck and don't hesitate to contact me with any fitness question you may have. I have decided to extend this great offer I told you guys about last month. 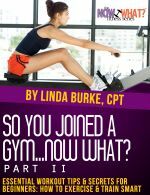 I still need book reviews for my latest and I think greatest book, Joined a Gym II. Yup, I dropped the marketing ball on that one after releasing it too. So I am back on track with that; trying to light that fire again also. If you are interested, you can buy it at Amazon for a limited time offer. I have slashed my price at Amazon from $2.99 to .99 cents for the next 2 weeks. This book is 2-3 times longer than my others because it’s crammed with valuable content. In the meantime, SF’s sister site, my new blog site at fitnessforwomenover50.com has taken a back seat as I have focused all my attention on getting SF going again. But hang in there ladies! I will pick that ball back up super soonly! In keeping on theme, this month's featured exercise is a Bent Over Row. As I said before, I don't happen to have a video of a back row machine, but I do have its free weight equivalent, the bent over row done with dumbbells. Switch this out with the machine now and then for a great free weight back exercise option! Tip: Be sure to keep arm/elbow in tight and as close to the body as possible as you raise the dumbbell. Think good posture, keeping a natural slight arch in your lower back and flat upper back throughout. HEREIN LIES THE CHALLENGE: Do not allow elbow to flare out away from the body. Keep it tight and close as you raise the DB up more toward your hip bone rather than your chest (as shown in my vid).